Being centrally positioned it is close to restaurants, pubs ,hotels and shops. The property has been refurbished to a high standard. It has 4 bedrooms and 3 bathrooms and sleeps 7 guests. Individual rooms are also available upon request for overnight/short term lettings. From €300 - €550 per week full details on request. A refundable deposit of €200 is required. 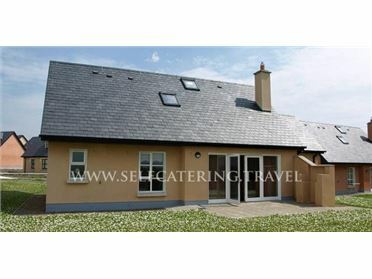 This seaside resort has magnificent views of Killala Bay and Bartra Island. It's seaweed baths are famous for relaxing. Waterpoint Aqua Park is a must for children and adults alike. The famous Enniscrone 18 hole championship links course, pitch & putt and fishing are other attractions. The Seaside town of Enniscrone, Co. Sligo is the perfect choice for your family holiday destination in Ireland. Among available activities It boasts Surf Schools, Horse Riding, Golf, Playground with crazy golf & much more. There is a breath catching sandy beach that runs for 5 Kms and is suitable for bathing and taking that long, leisurely walk. Eating out could not be more enjoyable in Enniscrone, with a great variety of restaurants, pub-grub & take- away's, offering fine dining for all the family.